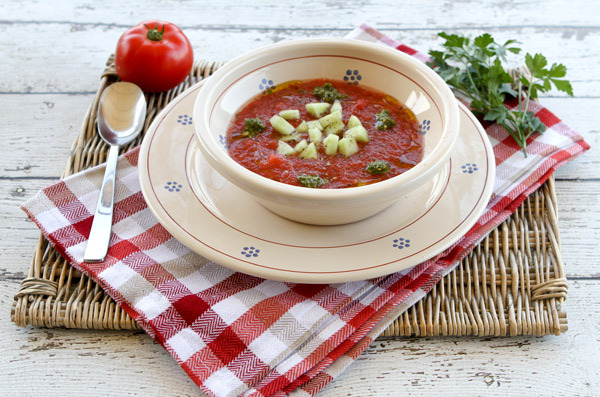 Gazpacho is a soup made of raw vegetables, most often with a tomato base that originated in Spanish region of Andalusia. 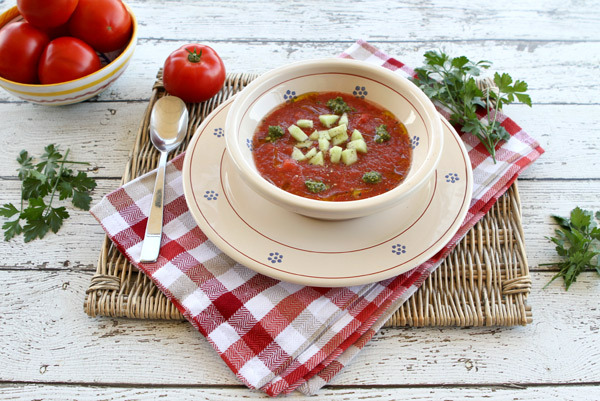 This tasty tomato soup served cold has become very popular during the warmer months and can now be found with many variations. The original recipe typically includes stale bread, tomato, cucumber, bell pepper, onion and garlic, olive oil, wine vinegar, water, and salt. 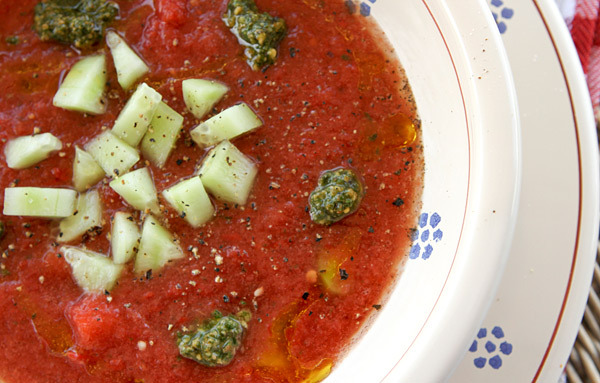 I have tasted many different types of gazpacho, and find I personally prefer a chunky constancy rather than a smooth pureed one. This particular recipe includes only vegetables, vinegar, and fresh herbs and spices. You can garnish this soup with anything from diced vegetables, chopped fresh herbs, golden crisp croutons, or even a dollop of sour cream or Greek yogurt. I added some diced cucumber along with some drops of fresh parsley pesto I made. The flavors in this soup are enhanced if prepared ahead of time and allowed to rest in the refrigerator overnight which makes it a perfect option for summer entertaining. Tomatoes are a source of vitamin A, vitamin C, dietary fiber and a great source of lycopene, a powerful antioxidant. Sweet peppers contain vitamin C, thiamine, vitamin B6, beta-carotene and folic acid. Peppers also contain phytochemicals, which are antioxidants that help neutralize free radicals in the body. 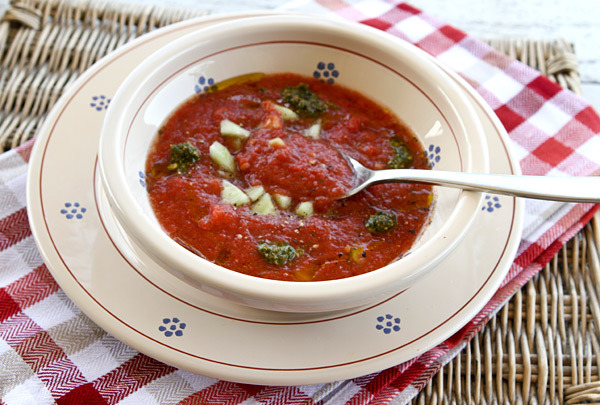 Place the tomato juice, half the tomatoes and garlic in a blender and process until smooth. Place the other half of the tomatoes, half the cucumber half the peppers into the blender and blend until smooth. Pour this mixture into the bowl and season well with salt, pepper, red pepper flakes, and basil. Add the remaining cucumber and peppers along with the vinegar. Serve chilled in individual bowls with garnish of choice.